He was born in 1833. Son of the famous Philadelphia composer Benjamin Cross (b. 1786, d. 1857); who was one of the founding members of the Music Fund Society of Philadelphia and one of its first Music Directors. Benjamin Cross, conductor, singer, organist, and composer, was born in Philadelphia and graduated from the University of Pennsylvania. He studied with two of the leading musical figures in Philadelphia, Benjamin Carr and Raynor Taylor. His skills as a vocalist made him a fixture on Philadelphia concert programs between 1810 and 1830. Among his many notable performances were Haydn’s Creation on June 10, 1822 at Washington Hall, Handel’s Dettingen Te Deum on December 29, 1824 at the opening of Musical Fund Hall, and in Handel’s Messiah on April 30, 1828. 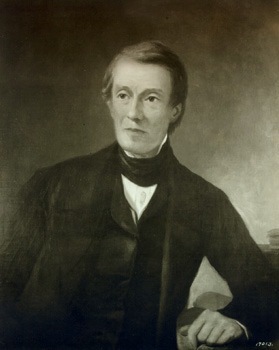 In 1820 Cross was a founding member of the Musical Fund Society of Philadelphia and one of its first Directors of Music. He conducted the society’s first operatic production on February 8, 1841, the American premiere of Mozart’s Magic Flute. During the 1840s Cross also served as the conductor of the orchestra at the Walnut Street Theatre. 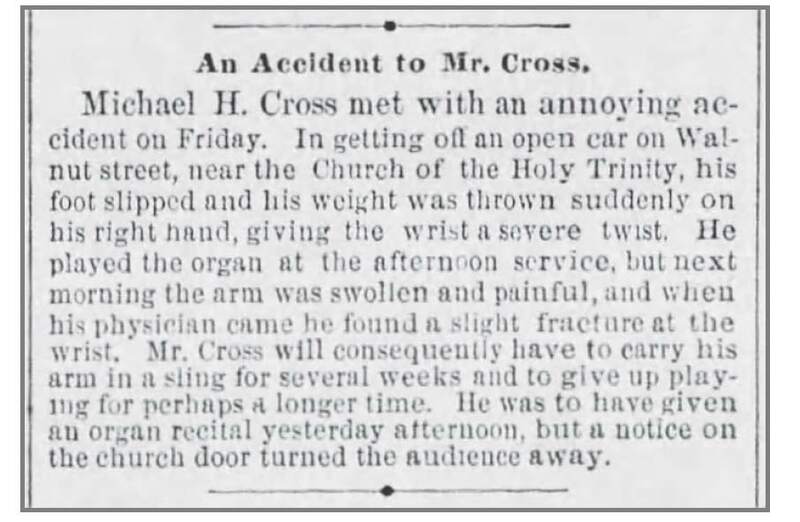 Cross succeeded Carr in 1831 as organist at St. Augustine’s Roman Catholic Church in Philadelphia. Michael continued his father’s musical legacy in Philadelphia as a dominant force in the field of choral conducting. He conducted the most prestigious choral groups in the city, including the Orpheus Club, the Abt male chorus, the Arion men’s singing society of Germantown, the Euridice women’s chorus, and the Cecelian mixed chorus. He was the organist of Saint Patrick’s church at the age of 10 and was the organist of Saint John’s Church, the then Pro-Cathedral of the Archdiocese, before becoming organist and choirmaster of the Cathedral on Logan Square from 1864 to 1877.• After leaving the Cathedral, he played at the First Baptist Church, the Beth Eden Church, and was music director at the Church of the Holy Trinity for the last 19 years of his life. 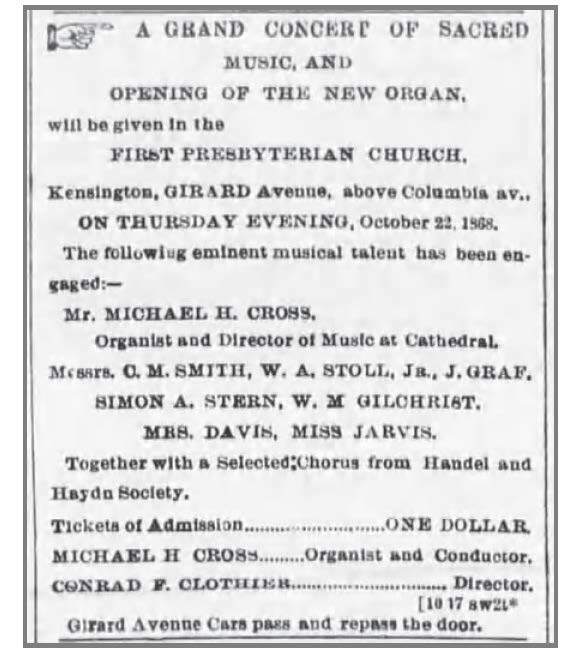 On October 21, 1868, he dedicated the new organ of the First Presbyterian Church in Kensington. 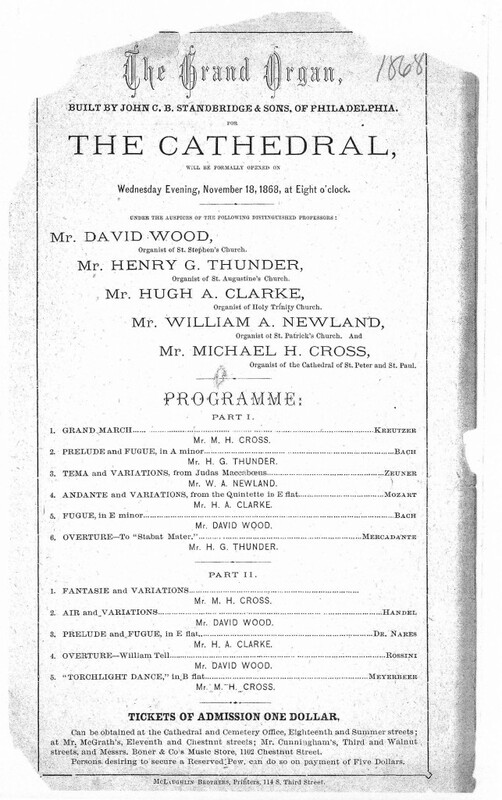 On November 18, 1868, along with several other organists, he inaugurated the cathedral organ built by John C.B. Standbridge & Sons of Philadelphia. Easter Sunday of 1869 the Cathedral Music , under the direction of Professor Michael Cross, was listed in the Catholic Standard and Times. Easter, April 15, 1871, under the direction of Michael H. Cross, the Cathedral Choir sang Te Deum by Mozart, Haydn’s Mass No. 6, Veni Sancti by Vogler, and Alma Virgo of Hummel. This is indicative of the type of music he promoted throughout his tenure as the Cathedral organist and choirmaster. 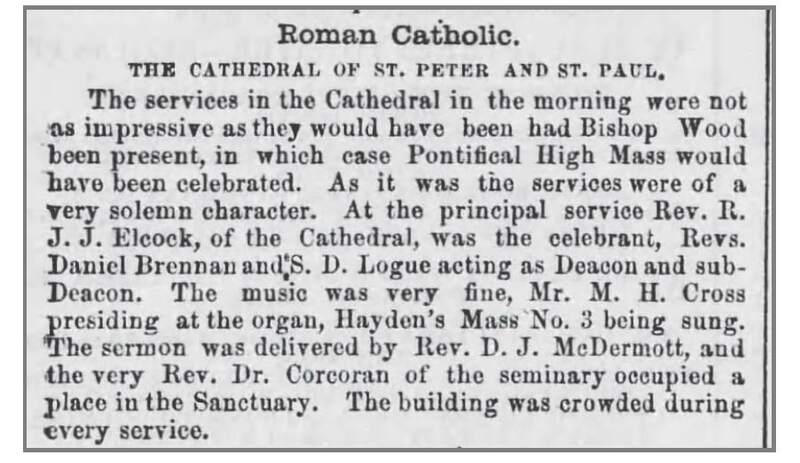 October 26, 1887, he delivered a paper entitled “Catholic Choirs and Choir Music in Philadelphia” to an assembly of the American Catholic Historical Society. His opinion was often sought on matters related to music and he was often quoted in newspapers and other publications. He was an active member of many music societies in the city of Philadelphia. He succumbed to heart disease in 1897.